The fenced backyard features a beautiful swimming pool with plenty of space to enjoy the sunshine. The beautiful kitchen is open to the living and dining areas and has a large island with stool seating. The dining table seats 8 with additional seating at the kitchen island. The living room has a large TV, sleeper sofa and is open to the kitchen and dining area. Another view of the living area, kitchen and dining area. Along with the washer and dryer, the laundry room has an extra fridge and freezer. The spacious master bedroom has 1 king bed, private bath and access to the gulf view front deck. The spacious master bath features a double vanity and large shower. This bedroom has 1 queen bed, private bath and access to the gulf view front deck. This bathroom is private to bedroom 2. This bedroom has 1 queen bed, shares a bath with the living area and has a shared balcony overlooking the backyard. This bedroom is accessible from the hallway as well as bedroom 3. This bedroom has 1 queen bed, private bath and a shared balcony overlooking the backyard. This bathroom is private to bedroom 4. This bedroom has 1 queen bed, private bath and a private balcony overlooking the backyard. This bathroom is private to bedroom 5. There is plenty of shaded parking underneath the home. The beautiful white sand and emerald green water is just a few steps from the home. This balcony is shared by bedrooms 3 and 4 and over looks the backyard. This balcony is private to bedroom 5. The large front deck has views of the beach and plenty of space to relax and enjoy time with family and friends. This property is available for Sunday-to-Sunday rentals in peak summer! Brand new five-bedroom, five bath home at 209 Ariola Drive with a private pool and easy access across two lane residential street to the white sands of Pensacola Beach. The large covered front porch has lots of lounging space and terrific views of the Gulf of Mexico. The open living room, dining room and kitchen are ideal for family gatherings. Each of the five bedrooms has a private bath and the master bedroom has a private entry off the front porch. Easy Gulf beach access located just 100' from this home via public easement. The pool is located directly behind the home and is enclosed by privacy fencing. There are two bedrooms with private balconies overlooking the pool. Book now and be one of the first guests to enjoy this pristine new home. Nice location, close to the beach and walkable to shops, restaurants and bars. Thank you for your review! We're happy to hear that you enjoyed your stay at 209 Ariola and we look forward to your return! Second year renting this property. Love the location and the house. Lots of room to have family to stay. Two refrigerators is nice! Ideal for two families. Everything is close by walking to shop or go to eat and of course the beach! Would like to stay there again. Must mention the team at Paadise Beach rentals who are the hardest working team you will find anywhere. Have worked with them for about five years and they have impressed me time and time again. Thank you so much for taking time to post your review and for your repeat business! We are so glad you were pleased with our services and your accommodations. We hope to see you again very soon! The beach home was very nice and talk about enjoyable. Everything you would need practically right there ! When we arrived we found the home clean and ready for my family to relax and enjoy the upcoming wedding that was planned As well as the beaches that were clean and just down right fun. Will certainly return . It sounds like you really enjoyed your stay at 209 Ariola Drive! That's exactly what we want our guests to experience. We're glad to hear that you had everything you needed and we look forward to your return! Wonderful time, directly across from the beach. House was very spacious and the pool was a life saver when you have grandchildren. We're so happy to hear that you enjoyed your stay at 209 Ariola! We hope you come stay with us again very soon! the house was great except for a few things. No dressers to put clothes away Also no pantry and ice maker. Otherwise the house was great. Thank you for taking time to post your review. We appreciate the feedback and will certainly discuss getting dressers and a pantry for the home. It does have an ice maker in the refrigerator door though. We are glad to hear that you enjoyed your stay and we hope to see you again very soon! We are 9 people who get together in Pensacola beach every year for Labor Day. This gorgeous house right across from the beach is perfect for us: 5 bedrooms and 5 baths. The house is comfortable and with the pool we can beach it or hangout at the pool. Perfect place. This is our second year and we hope to reserve it every year!!! Thank you for posting your review! We're so glad to hear that you enjoyed your vacation at 209 Ariola Drive. We hope to see you again soon! We have stayed in Pensacola Beach beach houses for 6 years and everyone decided that this was the best one yet! Absolutely beautiful home with perfect floor plan! The home at 209 Ariola is a beautiful home and we are so glad you enjoyed your stay! We hope to see you again soon! We had a fantastic time. This home was very clean with great amenities. We would highly recommend it. The pool was a great plus! Thank you for posting your review! We're so glad you enjoyed your stay at 209 Ariola Drive and we look forward to your return! Smooth and easy experience. Great communication. No worries vacation planning. We're happy to hear that you enjoyed your stay with Paradise Beach Homes! We look forward to your return! Our family enjoys spending time on the large front porch, day & night. The porch is where we have coffee to stat out the day. Thank you for staying with us! We are so glad you enjoyed your vacation and we look forward to your return! We enjoyed our week long stay with our children and grandchildren. The home had plenty of space in the main living area for meals and relaxing. The 2 refrigerators, 5 bathrooms and laundry were very handy. We made many loving memories on the spacious deck overlooking the gulf, in the pool and pool area with play and BBQ meals. The proximity to the beach was perfect and being close to restaurants, bars and shopping added to the overall experience. We will definitely return. This was our second visit in three years. We love this place. However, the living area furniture is very stained, worn out and uncomfortable. There was very nice new wooden outdoor furniture but the metal furniture was very rusty and had bent legs. Its a beautiful home and location, but furnishings need to be replaced. Thank you for choosing Paradise Beach Homes. We are glad to hear you enjoyed your stay at Ariola 209. Thank you very much for your feedback regarding the furniture. We have passed the information along to the owner, and hope to see you again on your next visit to Pensacola Beach! Awesome view of the gulf!! Easy access to the beach !! A very enjoyable stay. We are so glad to hear you enjoyed your stay at Ariola 209 and look forward to seeing you again on your next trip to Pensacola Beach! Family of 11 with 3 generations stayed together for one week. Ages ranged from 11 months old to 64 years old. We had a blast. Everyone had their own bedroom and bathroom. We had plenty of room to do what we wanted. The pool was cold but we should have realized that when we booked it for the first week in April. There are some items that need attention but overall we are very satisfied. We will be booking for 2019 Spring Break. Nice experience. Like the property. This house was wonderful in every way. Great location, spotless, roomy, right across from the beach. We hope to come back sooner rather than later. Wonderful Stay on P'cola Beach! I would highly recommend 209 Ariola for anyone interested in staying on Pensacola Beach. The house is well laid out, comfortable, well stocked and perfectly located. I also want to put in a good word for the owner, Alex, who was very helpful and responsive; and our experience with Paradise Beach Homes was easy, professional, and friendly. The house is great! Across the street from the Gulf, with an unobstructed view, a nice sized swimming pool, within walking distance to shops and restaurants, and room for everyone to spread out. We especially loved the front porch with the beautiful view of the Gulf. We enjoyed morning coffee, lunch and happy hour under the shade. I'm originally from Pensacola and we frequently visit family and prefer staying on the beach when we do -- we will definitely stay here again!! Perfect for a group of couples! Our group of five couples rented this house for Vettes at the Beach. It was perfect, as every room had a queen bed or larger and each had an en suite bathroom. Convenient to beach, restaurants, and shopping. Everything was ok until I got to the property. one bathroom didn't have a working toilet paradise assured me that it would be fixed as if that's not a inconvenience..well the next day plumbercame to fix the toilet her still wasn't able to fix it..Call to talk to paradise and they acted as if it was ok ( The lady at office tells me,but you have four of bathrooms that works). That's bad business cause when u have 5 families that are staying and all family paid equally amount that's unfair and a inconvenance to everyone else....I guess since it wasn't there bathroom or they wasn't the one's renting there ok.... That unacceptable on all levels..
We had an amazing trip! House has such a great view of the gulf from the front porch. And steps away from the gulf which is nice because we had small children. We had a wonderful time in Pensacola. The house setup was perfect for our group and the proximity to the beach was ideal. Will definitely return. Great amenities in the rental and loved that it was event friendly. Would love to stay here again! It was great. The home was so nice. The view is wonderful. When I called Paradise Beach Homes I talked with Brenda. She was very helpful and nice. Perfect! Beautiful home, great location, plenty of parking, wonderful gulf view, too cool but a great pool. Eight adults and an infant had room to share common spaces but could also retreat to their own private bedroom. Close to beach/plenty of good restaurants within walking distance/enough amenities to keep busy. Didn't think we'd want to swim in December but the weather was nice enough that we should have paid to have the pool water heated. Some of us braved the ocean instead. Only downsides were: 16 stairs to get to the living area (so keep in mind if you are traveling with disabled/elderly) and some of the cooking utensils/pans need replacing. All in all a great place to rent. This is a great house only steps from the beach! We loved the 5 bedrooms and 5 bathrooms! The kitchen is well stocked . The owner was very great to work with. Some in my party were not very complimentary of the bedding in 2 of the smaller rooms. I was in the master and it was great! we would definitely stay here again! Property was clean and nice ocean view and have a nice pool. I stayed on Labor day, it was rain, but my kids are very exited to go the ocean and pool back and forth many times a day. We enjoyed BBQ in property backyard, it was nice as well. I had a wonderful time staying in this lovely yellow house, so much space, a bathroom for every room, our own private pool! What more could I ask for, a view of the beach? Had that too!! Also a very nice welcome bag upon arrival was a very nice touch. The house was perfect. Loved that each family had their own bathrooms attached to their bedroom. Extra fridge in laundry room is such a plus! Pool was great & location was great. Would booked again in a second!! The house is perfect for a family vacation! The pool was great and the beach access was right in front of the house. It was perfect! The home, the location, the weather: all were perfect. The only negative was the condition of the water then only God could have changed that. We had a great time with our annual family outing. Will see you next year. The house was beautiful. We loved that it had 5 bedrooms and bathrooms. We loved the location and that it had a pool. We like the new wood furniture that was delivered while we were there. The only criticism, the wood work and cabinets could of been cleaned better. 209 Ariola Drive Dream Come True! This is our second year in a row staying at this house, it's truly a dream home. We have 5 adults & 3 children stay very comfortably in this house. We love the convenience of the pool & the location to the beach couldn't be better!! We hope to be back, Pensacola feels so much like a second home & we can only have the owner of this property to thank for that! House is beaitful, everyone in my family from 4 years to to grand Mother live it. While wevstay there, We want to come back to this house for Jul 4 but not available. The home was spacious and everything we needed was at the home. We would love to come back to this home next time we visit Pensacola Beach. Loved, loved this house. The pictures do not do it justice. I am the OCD type. This place was immaculate. Perfect location as well. We arrived after dark and we could hear the waves crashing into the shore. The morning view didn't disappoint either. Alex was awesome to do business with as well as PBH. We will certainly go back as well as refer this beautiful home to others. We were very pleased with our stay at what we called "the yellow house". It was a short weekend trip to attend two basketball games at my daughter, s college. There were 10 of us, along with 2 of my daughter's teammates. 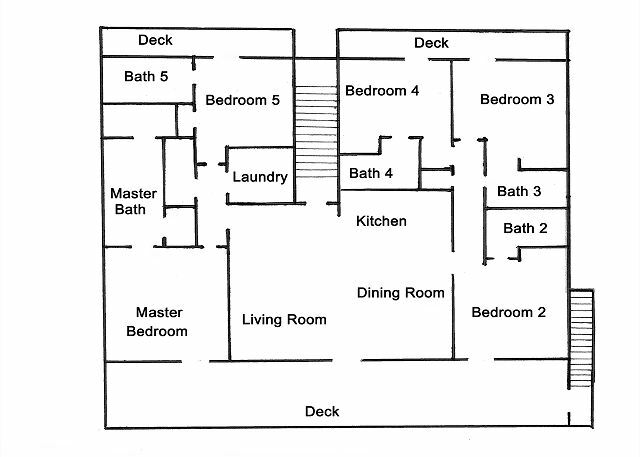 We really liked the house layout with every bedroom having its own bathroom. Would like today recommend that an additional couch be added in living room. Also such a nice porch needs some comfortable furniture to enjoy the view. This was our 2nd year staying at this location for our Mardi Gras weekend getaway -- This house is great for a group of people to stay in. Perfect location close enough to walk to Casino Beach and the boardwalk. Beautiful view of the Gulf even in November! Great location on the Gulf for a gathering of a group of college friends from across the south. Our location was only minutes from the boardwalk and lots of little shops for picking up Christmas presents for family members back home. Lunching at Peg Leg Pete's and then touring Ft. Pickens introduced everyone to the history of the area. Even while the rain was coming down on Sunday, we were able to enjoy a Champagne Brunch at Flounder's and still know we were on the beach. Beach Homes agents were very responsive to our needs, and I will continue to always rent through them. Thank you for a great vacation! I plan to return next year, because, even the young teenagers loved it! Overall we had a delightful time. In the third row of houses from the gulf beach with great views of the water from the house front windows and deck.Very private street close to the island center restaurants and shops. Very clean and kitchen well appointed. A few more comfortable chairs in the living area would be nice. A very nice spot for a vacation retreat. Our family of 12 (our 3 children and spouses and 5 grandchildren) stayed here for a week and absolutely loved it! The home is beautiful and has gorgeous views of the Gulf from the large balcony. It is very spacious and set up nicely for several families to enjoy, with each bedroom having its own bathroom. The grandchildren were perfectly happy spending hours in the pool or across the street at the beach. It's just a few blocks from Pensacola Beach and all the shops and restaurants. The people at the rental agency were so kind and helpful, providing anything we needed...toaster went out and they provided new one the same day. We asked about doing a seafood boil and they even provided us with the huge pot and burner to do that!! We hope to return here again and again!! the only thing that I saw that might be helpful was some extra blankets. but other than that we loved it. Thank you for staying with us at Ariola 209. The property is less than a year old and in great condition. We hope to see you again soon! We had a great relaxing time with friends. This house was perfect for our stay. We went with a couple other families and had a blast. There was plenty of room so we didn't feel on top of each other. I loved all the porches off the bedrooms. The kitchen had everything you could possibly need. This house is just steps from the beach. The children loved the pool, however I would recommend putting in a heater. We went in October so with the house shading the pool during the sunny part of the day, the water was chilly. That is the ONLY recommendation I have for this house. We ate out 3 times and went to Flounders, Peg Leg Pete's and Red Fish Blue Fish. All 3 restaurants were great!!! The food is wonderful and the atmosphere at all 3 is great for children because they all have play areas to entertain so the adults can enjoy each other while waiting for the food. Pensacola Beach is a favorite of ours and we will be back. We hope staying at this house will become a tradition!!! Everything was awesome. Would visit again and stay there no questions asked. The best holidays we have ever had! Thank you so much for this stay. We were very please with this new construction. Ample space, very neat, well laid out. Nice pool. Covered parking for all our cars. Mere steps from the beach with a gret view of the Gulf from balcony. Highly recommended. The house was great for our family. The bedrooms need chest of drawers to place your clothes. Not everything can go in a closet and a week is a long time to live out of a suitcase. This home was even better than advertised. The two refrigerators were a great bonus. We have never been in a home with such a supply of dishes, hardware, towels, etc. Even a crock - pot. The pool was fantastic and the beach was a very short walk. The wrap around front porch was delightful anytime of day. We will be coming back again next year. This house is perfect for groups! 5bd 5ba with it's own pool and very short walk to the beach! I have been planning ladie's get away trips for 15 years and have rented many properties along the Pensacola and gulf shores area. This place is as upscale as a penthouse with the cozy feel of private home. Thank you to the owner Alex for allowing us to stay in this lovely and well thought out home! Loved all the bathrooms. The extra refrigerator was great too. We really enjoyed our stay at 209. Loved breakfasts out on the big front porch and sitting in the pool in the evenings. Everyone in our group kept commenting on what a great house I had rented, with great space, great location, being close to the beach and town. Only down side was we had a bike stolen. Forgot to put it in storeroom. Look forward to another stay.